DI MATTEO specialises in efficient handling of bulk materials, with services that include conveying, unloading, storing, discharging and dosing. With expert knowledge and experience of more than 45 years, DI MATTEO can support you with your bulk materials; i.e. process optimisation or the development of turnkey plants. Whether it is bulk material technology, process engineering, material handling or environmental technology, each component is developed, manufactured and installed by DI MATTEO. All products, components and systems combine established technology with state-of-the-art know-how. Every division complements one another; the gearing is perfected in order to provide you with a tailor-made system for your company. All products are 100% made in Germany. Secondary fuels can potentially decide whether or not a company remains competitive, especially in energy-intensive areas such as the cement or power plant industry. DI MATTEO has carried out pioneering work in the use of secondary fuels. We offer innovative and proven systems or custom-made solutions for the successful use of alternative fuels, ranging from concept and development, to commissioning and after-sales service. All systems are built in modular form and can be designed to be mobile, semi-mobile or stationary. DI MATTEO offers standardised and customised solutions in various sizes and designs for mechanical or pneumatic silo feeding systems. Our specialists and engineers take care of the entire planning, from concept to commissioning. It is always your bulk that defines the requirements, whether it is dispersed, free-flowing, cohesive or poor-flowing. Silos are available in a variety of forms, from round and rectangular silos to octagonal silos, they are customised to meet your needs. The advantages of polygonal silos are obvious, they are made as modules and can be extended due to a suitable steel construction, even retrospectively. The transportation of individual modules is simple and cost-effective, resulting in even large silos being transported by truck and installed onsite. With mechanical conveying, DI MATTEO provides innovative, goal-oriented, custom and sustainable technology. You have the choice between solutions for your whole process or partial solutions for specific areas. It is always your bulk materials that determine the solution. When it comes to bulk materials, there is nothing we cannot handle. Coarse-grained, fine-grained, liquid, poor-flowing, organic, inorganic, abrasive, hot and many other materials and consistencies. These materials require very specific methods of handling. DI MATTEO established products for mechanical conveying, including high-capacity bucket elevators, screw conveyors, drag chain conveyors, apron conveyors, surface feeders and belt conveyors, for both open and closed conveyor systems. Pneumatic conveying involves the transportation of bulk goods through pressure or suction conveyors. The conveying takes place in pipes, hoses or fluid channels, depending on process-related conditions. Air gets things moving. Because of this, bulk materials can be transported over a distance of up to 2,000m without intermediate stations. The patented injector rotary feeder IZS® connects the advantages of the well-known rotary feeder with the requirements of feeding-problematic bulk materials such as secondary fuels, sewage sludge, bypass-dusts or lime-hydrate, in pneumatic pipeline systems. The ODM-WeighTUBE® allows alternative fuels such as municipal solid waste or industrial waste to be weighed both rapidly and precisely. It is also usable for abrasive and other conventionally bulk materials. The WeighTUBE has minimal maintenance requirements, is easy to integrate into existing plants and has a low height, with a compact design. The new patented system is considered groundbreaking for this type of dosing application. Our special screw systems ODM-ScrewDOS® are used for the regulated and continuous discharge of almost any kind of bulk materials from silos. DI MATTEO offers special moving and push floor systems for poor-flowing bulk solids, i.e. biomass or other alternative fuels. The loading / unloading conveyors are suitable for installations in rectangular bunkers and can be used for the charging and discharging of bulk materials. With our services, business relationships do not end after installation. We would like you to see us as your contact after a sale, and offer our efficient in-house services, with qualified employees who will not miss out anything. Our spare parts service: quick delivery in case of necessity. The company was founded in 1968 by Orlando Di Matteo in Beckum. Today, in the second generation, Dr Luigi Di Matteo and Clelia Di Matteo work alongside the founder. 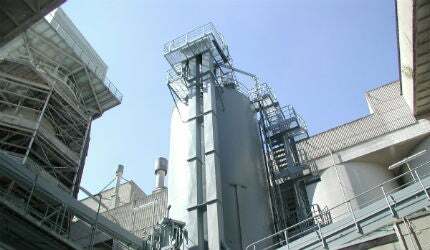 Primarily a supplier to the cement industry, DI MATTEO has developed into a leading expert in the special fields of bulk material, conveying, silo and process-technology. The business division of alternative fuels is positioned as a special key segment, where DI MATTEO has achieved market leadership. DI MATTEO products are supplied worldwide to customers in all areas of bulk material industries such as minerals, foundries, steelworks, chemicals and glass, as well as coal preparation and waste incineration plants, in addition to environmental and recycling industries.